Want some tips for stretching your garden budget a little farther this fall? 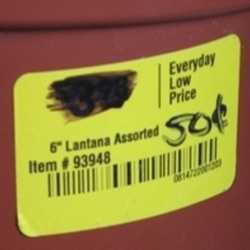 Overgrown pots of perennials look pretty tattered by the end of summer, and they get marked down accordingly. 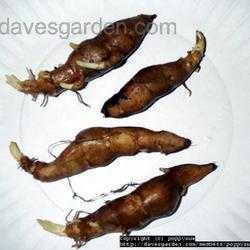 For gardeners in the know, these root-bound plants are an opportunity! Especially in fall, the true value of perennial plants lies in their root systems, not in their bedraggled tops. Divide them for an even greater return on your bargain-priced investment. Rootbound plants are common at the end of the season. 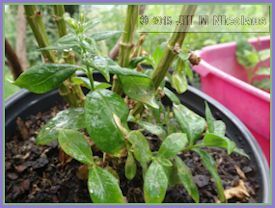 Some won’t recover well, even after careful planting. In my garden, this is especially true for shrubs and woody herbs. They’re still worth trying if the price is right, but know that you’re rolling the dice. 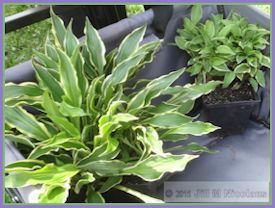 Dividing a rootbound plant and repotting it into two or three containers can both both revive and multiply a bargain purchase. Plants that are starting to go dormant in your own garden will probably look completely dead by now in nursery pots. If the stems have even a little green or flexibility, that’s a good sign that they haven’t been all-the-way-dead since July. 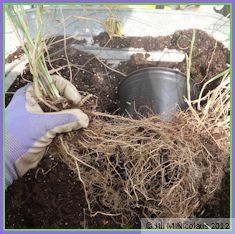 Check the bottom of the pot for healthy roots, or even tip the plant gently out of its pot, if possible, to take a look. Healthy roots are usually light colored, round and plump. 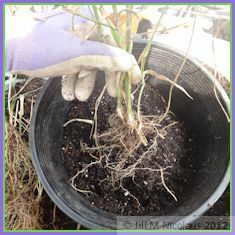 Most types of plants should have both bigger roots and lots of hairy little “feeder” roots. Dead roots are usually dark, either dried up to threads or starting to soften and rot. Without good roots, a bargain plant is no bargain. Perennials that grow from central stems are usually propagated from cuttings rather than by division. On these plants, look for side shoots. An extra shoot will often have a few roots attached to it below the soil. Cut it free, and you have an already-rooted cutting. Pots that seem to contain two or three smaller plants rather than one larger central plant are excellent candidates for division. When I go nursery stomping with a friend, we always look for pots with bonus shoots to share! The best candidates for division are perennials that grow outward into clumps. Looking closely into the leaves and stems of these clumps, you can make out individual tufts of foliage or circular rosettes of leaves. Each of those individual portions of the clump can potentially be separated into a new plant. Taking larger divisions with several rosettes is often easier and more successful, especially if the roots are thoroughly tangled. My heart beats faster when I see a tattered clearance plant with several areas of new growth. I know I can turn that bargain plant into a super-bargain. 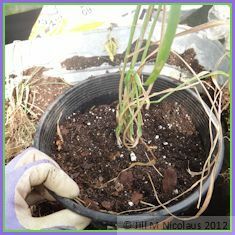 Tip the plant out of its pot, and loosen the roots up a bit. 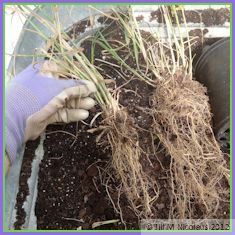 Either “tickle” roots apart you’re your fingers, or hose off some of the potting mix. Now you can see where to separate the plant to get well-rooted divisions. 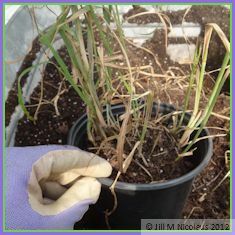 Grasp a rosette or a clump of stems with one hand, and break it away from the larger clump -- twisting, teasing, jiggling, whatever seems likely to leave the most roots attached to the division. Take time to choose where you’ll make the separations, then just go at it; don’t be timid. Some plants, especially daylilies and hostas, may have to be cut with a knife. You’ll get a lot of divisions from a crowded pot, so don’t worry about damaging a few roots or stems. A little TLC helps new divisions increase quickly. I cater to both roots and top growth by adding time-release fertilizer pellets and polymer moisture crystals. 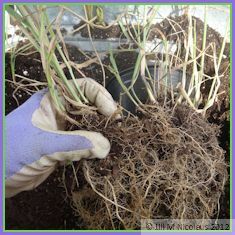 Spread roots out and cover gently with crumbled soil or potting mix. Divisions should be planted at about the same level as they were in their original pot. Take care to not bury the crown, or center, of a rosette of leaves. Water well to settle the soil or potting mix around the roots. 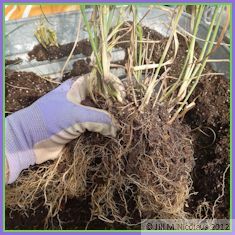 A weak drink of water-soluble fertilizer or compost tea will give the roots an additional boost. Pot up or plant out? Why not do both? 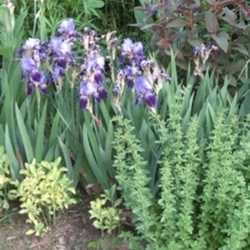 Take one or more smaller divisions from the perimeter of a crowded pot and plant out the rest. Now you have a plant in your garden and a “backup” pot or two. Let those backups grow big roots over the winter. You’ll have nice specimens to plant out, share, or trade in spring. I protect potted plants in winter by grouping them together on sheltered gravel or paver surfaces, creating a heat sink that soaks up warmth and sunshine. I learned the hard way that grasses are an exception to this method. 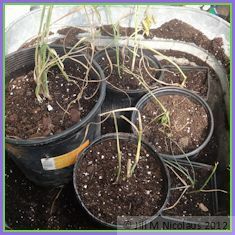 Large or small, hardy to zone 3 or barely hardy in my zone 6, grasses simply do not survive well in pots over the winter. As you hunt for bargain plants this fall, remember that roots are what matters. Examine plants with an eye toward dividing them, also. Instead of planting out one bargain specimen this fall, you could plant a whole sweep of plants in spring. With experience, you’ll learn which bargains are not a good deal after all and which have the potential to be super-bargains. Happy hunting! Photos by Jill M Nicolaus. "Mouse over" images and links to get additional information in a popup window. 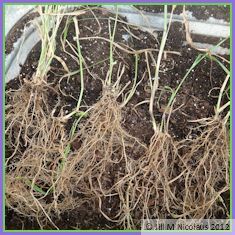 For additional information and photos of root systems, see my earlier article, "Not Quite Dead: Re-growing from the Root Up."